Connect your iOS device to your computer using the included Dock Connector to USB cable. Launch iTunes 9.1 or later on your computer. Select your iOS device from the Devices section of iTunes. Click the Apps tab and scroll down to the bottom of the page. Note: If you do not see the File Sharing section shown in the image below, your iOS device does not have any apps that support File Sharing. Under the File Sharing section, you'll find a list of apps currently installed on your iOS device that support File Sharing. Select an app to view a list of the files associated with that app on your iOS device. Be sure to select the appropriate application in the Apps list under File Sharing. Click the Add… button, locate the file or files you want to copy from your computer, and click Choose. The selected files will be copied to the app on your iOS device immediately. Select only files that are supported by the iOS device app. Refer to the iOS app’s documentation to determine which file formats it supports. 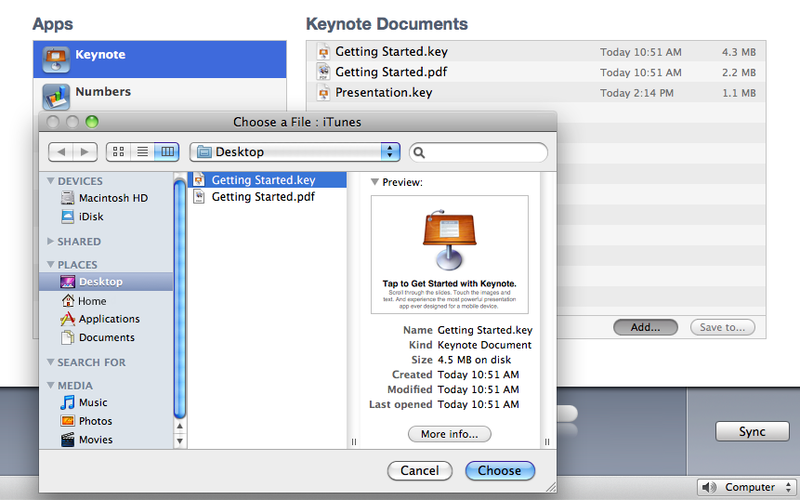 Select the file or files you want to copy to your computer from the Documents list and click the "Save to…" button. Select only files that are supported by the iOS app. Refer to the iOS app’s documentation to determine which file formats it supports. Locate the folder on your computer to which you want to copy the files and click the Choose button. The selected files will be copied to the selected folder on your computer immediately. 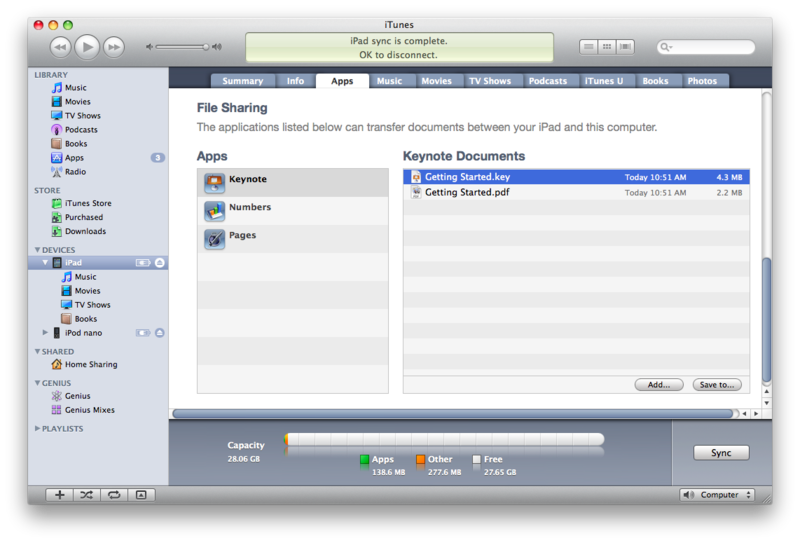 File Sharing enables you to copy files from your computer to apps on your iOS device and from those apps to your computer. Not all iOS apps support File Sharing. Using File Sharing, files are copied into an iOS app and can only be opened from within that app if the app supports it. Refer to the documentation that came with the iOS app to determine supported file formats, and how to interact with shared documents. Will I lose the files shared to an application if I delete that app from my iOS device? Yes. Deleting an app on your iOS device with shared files will also delete the files on the iOS device associated with it. To avoid losing shared files on your iOS device associated with the app, back up and copy shared files to your computer frequently, and especially prior to deleting the application from your iOS device. How do I back up shared files? iTunes will back up the shared files on your iOS device when it syncs your iOS device with your computer. You cannot select and restore specific files from a backup, so be sure to copy files you have created on your iOS device frequently to a folder on your computer. Where do I find files copied to apps on my iOS device? The files you copy from your computer are only accessible from within the app on the iOS device to which you have copied the file. They are not accessible from other apps or locations on your iOS device. You can view the list of files under the File Sharing section of the Apps tab in iTunes when your iOS device is connected to your computer. See "How to copy files using File Sharing," above. How do I delete files I copied to an app on my iOS device? Attach your iOS device to your computer. 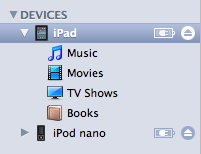 Select your iOS device in the Devices section of iTunes. Click the Apps tab, then scroll down to the File Sharing section. Select the application from which you would like to delete a specific file. 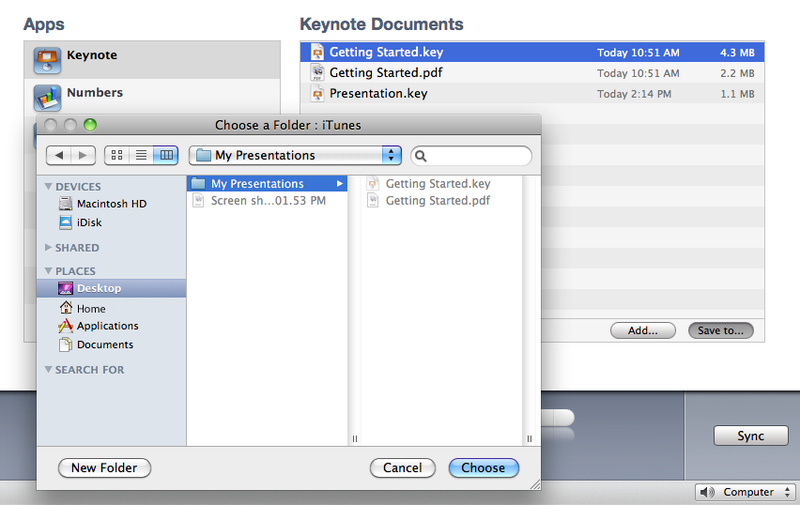 Select the file from the Documents list and press the Delete key on your keyboard. When prompted to confirm your request, click Delete. The file will be deleted from the app on your iOS device immediately. Some applications may also support additional methods for deleting files. Refer to your application's documentation for further information.